Wow, this weekend so far has been nothing short of amazing. Yesterday, the three of us made our way into Manzini. We were all very excited. Julia even told us that it was such a special day that she decided to wear BOTH deodourant and underwear. Manzini is about an hours drive away from here. It is basically on the other side of the country which gives you some idea how small Swaziland it. Our first stop was “Swazi Candles” and I was just so impressed. It had a candle shop (obviously) as well as a market selling African curios (souvenirs) and an amazing little restaurant. We sat and had coffee (the real stuff- not what they sell here in Siteki) and then we ordered lunch. It was just beautiful. I had grilled Mediterranean vegetables with pesto and mozzarella, toasted in pita bread. After what I have been eating for the past 2 weeks, I honestly thought I was in food heaven. We then shared an American brownie which was delicious. We have vowed to visit this place once a month because the food simply enriched our souls. We then headed to “Pick and Pay”- a large grocery store. The variety of food was overwhelming and I stocked up with enough food to hopefully last me a month. I was almost delirious with choice. I could get anything that I would normally get in Australia and many of the brands were the same as what is on offer in Australia. I also picked myself up a South African edition of the magazine called “Marie Claire”. I was a little hesitant about buying it- with no TV and radio here, I was going to try and stay away from “western frivolity” but when I saw the magazine, I just had to have it. I have to admit there are times when I am so bored here. If I’m not reading a textbook, I’m reading a book and there are times when I am so tired that I just can’t read either- the magazine will allow me to just sit and look at pictures and escape from the reality which lies outside my window. I also felt enormous guilt about the food that I was buying. Just last week, I started to identify some real classic effects of malnutrition. Don’t get me wrong- I am not a brilliant doctor, but I started to see a few patients with symptoms that I could just not work out and I was almost certain it wasn’t due to AIDS. I started to do a lot of reading but it was only after talking to Julia that the penny finally dropped for me. Some of my medical colleagues will probably think I’m a bit slow for not having picked up on it earlier, but I have been so consumed with learning as much as I can about HIV and TB, that I didn’t start to think about vitamin deficiencies. Julia goes around to many homesteads handing out medication and food. Her group gives out maize- the staple diet here in Swaziland. The World Food Programme (a branch of the WHO) also works from the Good Shepherd and they give AIDS and TB patients 6kg/ month of a soy-maize based mixture. However, WFP are not able to reach everyone and Julia’s group tend to reach out to the more remote homesteads. Julia tells me that the people out there do not have anything else to eat- maize is the only thing they have on offer. They often don’t have any water and this would explain the bizarre urine that my patients sometimes produce. It’s a very dark amber colour and almost as thick as molasses- it’s quite intriguing. Anyway, when I thought about the nutritional content of maize I finally realised that some of my patients are deficient in Vitamin B and Niacin. The syndromes I am seeing are called dry Berri berri and pellagra and after a couple of days of vitamins, my patients are starting to get better. It breaks my heart that people here don’t even have proper nutrition- how are they ever expected to have any resilience against disease? At midday, Chris suddenly decided that she wanted to go out and because we still had the car, we decided to go to Hlane- a game park about half an hour from here. It just blows me away that we are able to suddenly decide to go out and within half an hour we’re doing a safari. First of all, we had a picnic next to a watering hole where we watched a mother warthog and her two babies drink and bathe. There was also an amazing amount of bird life around. 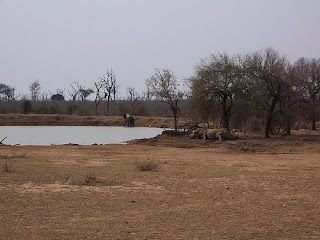 There were rhinos within 30 metres of us and an elephant came down and took a bath. We then went on a sunset safari where we were literally metres away from elephants, giraffe, antelope and my all time favourite- lions. We were incredibly lucky to be about 5 metres away from a male, three females and two cubs. It was just magic. I saw all of this on my trip to Kenya and Tanzania in 2005, but it is still magical second time around. I decided that I was up to driving home. I had been somewhat reluctant, but I am using my four months here to try and instil in mysel a little well needed bravery. The car we hired was a Toyota made in the 1980s and it was a manual drive. I can drive a manual car (although my sister may argue with me on that point), but I much prefer an automatic. One month ago, I would never have thought that I would be driving a manual car along a really bad dirt road, in the dark, dodging impala, but I did it. I know this may not sound like much to some of you, but I was really proud of myself. I drove really well although I was very nervous. I do not want to drive at night here again, but I know if the need arises, I can do it. Watch out world- Mel is getting brave…. Yet another week has ended at the Good Shepherd. It’s only been two weeks and yet I feel like I have been here all my life. I definitely have a “routine” during the week, but it helps to have a routine when everything else around me is chaotic. I have stopped having the nightmares. I’m still not sleeping well thanks to mosquitoes and mysterious noises throughout the night. I confided in my friends that I was having nightmares and they identified with me immediately. Julia told me that she had nightmares every night for a month when she first arrived and Christina (Chris) told me that she takes drugs to help her sleep. I guess this is just all part of the experience. At least I know I am not alone. I thought I would take this opportunity to tell you a bit about my two best friends in Swaziland. Chris, as mentioned previously, is from Cincinnatti. She is my mothers’ age (very, very young…) and she has worked in Swaziland on three occasions. Back in the States, she works for a programme which visits homeless shelters and provides health care for those who can’t afford it. She has also worked in the prison system and I think this woman has seen a lot in her lifetime. Chris makes me laugh everyday and it’s not just a giggle. She is so incredibly funny that I often find myself rolling around in my chair, tears streaming down my face and my sides ache the next day because I laugh so much. She is a ray of sunshine in this place. Chris struggles a bit with the walk back from Siteki. She gets a little breathless, so she stops, has a cigarette and continues on her way. I love her for this. I also love the fact that she hugs me everyday. I am a very tactile person and that hug everyday just gives me the strength to carry on. Julia is a truly beautiful spirit. She is 23 years of age and has just graduated from nursing school. She has been in Swaziland for almost 12 months and she is very much a local. She speaks almost fluent SiSwati and she understands this culture better than anyone else here. She has really helped me a lot in trying to understand some of the crazy things my patients do. She works for the Home Based Care Programme which visits various “homesteads” (communities) and provides them with basic health care and much needed food. She goes into people’s “homes” and she really does pay witness to the good, the bad and the ugly. Her maturity is far beyond anything I have ever witnessed in any other 23 year old. She is incredibly brave and has a compassion that rivals that of Mother Theresa. I love these women to bits. I am overwhelmed by their courage, their kindness and their strength. They will see me through the difficult times here in Swazi and I can only hope that I provide them with some sort of comfort too. Chris says that she finds my consultations with patients hilarious. I certainly do have a unique style. Remember, not many of my patients speak English, so everything is said through an interpreter. The other day I had a woman with urinary stress incontinence. She had had 3 babies and now every time she coughs, sneezes or laughs, she has a little leak. I decided to teach her how to do pelvic floor exercises. This is not an easy task when your patient doesn’t speak English. Anyway, without even thinking, I put my hand between my legs and started pulling a face to demonstrate that I was squeezing my muscles in my nether-nether regions. As I said, I do a lot of things without really thinking how ridiculous they must seem. The patient, the interpreter and Chris were hysterical and Chris now refers to me as an expert in Keigel exercises-Swazi style. I am very excited about my weekend. Chris, Julia and I have hired a car and we are going to drive into Manzini. There is a large supermarket there and we plan to stock up on groceries so that we can have a bit more variety in our diet. We are also going to have lunch at a restaurant called Swazi Candles. The girls assure me that I will love it. I am looking forward to getting away from Siteki for the day. On Monday, we are going to the King’s 40th birthday. I have decided to go afterall. Everyone is going and I don’t want to be left alone here. Julia really wants to dance with the other women. This will involve her being bare chested. I am going to support her as God-knows what kind of trouble could erupt when a white girl is bare breasted. I know that last November when I got a little intoxicated at an Emergency Medicine conference, I threatened to dance at this festival to increase my chances of marrying the King, but I can assure you, I will remain fully clothed on Monday. Until then- have a good weekend. Today I woke up to find that during the night I had stripped the sheets off my bed and somehow I had wrapped myself up in the quilt so that I could barely move. I managed to untangle myself and when I looked in the mirror, I didn’t recognise myself. For the first time in my life, I looked haunted. Yesterday was a terrible day and I consequently experienced nightmares throughout the night. I do not usually suffer nightmares. I had four people die in front of me yesterday. One of the patients included my 13 year old, Patience. I knew her death was inevitable, but in the end it was quite gruesome. The three other patients who died yesterday were all younger than 30. I have obviously paid witness to death many times, but nothing on the scale of this. Dying from AIDS is one of the most horrible deaths I have ever seen. Before I left Australia, I knew that I would face this- I thought I was prepared, but the reality is far more than I could have ever imagined. I’m not falling apart, in fact, I haven’t shed a tear. Perhaps this is my problem. Perhaps a cathartic howl would do me good. I had my cup of tea this morning (this is my “drug” of choice at such times), had a shower and managed to face the day as positively as I could. Only one patient died whilst I was doing my ward round. I see this as somewhat of a good day. Nearly 50% of the population here have HIV. This statistic means that one in every two people have a life-limiting illness. Most will die before they are 40. Imagine if we lived that way in Australia or US. Imagine having this disease and knowing that your country does not have the resources to treat it. Imagine not having enough food or water so that your disease progresses so quickly because you are malnourished. Imagine that you have no job, no income and yet if you want to see a doctor you have to pay money. If your doctor orders a test, you have to pay money. If your doctor prescribes you a treatment, you have to pay money. In fact, so many people here cannot even pay the bus fare to actually get themselves to a doctor. Imagine if you are a doctor and you know that your patient has no money and you know that if you order a test, or even order paracetamol (acetaminophen), your patient somehow has to find the money. It breaks my heart and causes me great anguish. What has compounded my grief this week is the knowledge of what lies ahead next week. Next week, the King of Swaziland turns 40. This also coincides with Swaziland celebrating 40 years of independence. Huge celebrations are going to take place. In the newspapers, they tell us that 40 Mercedes Benz have been bought to transport officials- one of who is Mugabe from Zimbabwe. The King is also going to take a new wife next week. This will be his 13th. This week, he sent 10 of his wives, their children, the nannies and bodyguards to Dubai on a chartered aeroplane. This is for a holiday and perhaps so he can have some time alone with his new wife. The thought of all this happening whilst I pay witness to what is happening here makes me sick. But this is Africa. I was planning on going to the celebrations, but I feel as an advocate for my patients, I should not attend. I do not want to be seen to support this. However, escaping this place for a day may actually do me the world of good, so I will see how I feel. I hereby certify that I have examined …… and find that she is not mentally or physically defective in anyway. That she is not an idiot, epileptic, insane, mentally deficient, deaf and dumb, deaf and blind or dumb and blind and that she is not suffering from leprosy, TB or trachoma. Yesterday, I was delighted to meet a new volunteer who will work at the Good Shepherd until Christmas. Her name is Christina and she is a nurse practitioner from Cinncinatti. Her accent is typical mid-west and she is such a riot! This is her third stint at the Good Shepherd and she certainly knows her way around. She is helping me see patients in Outpatients and I feel that she is like an angel sent from Heaven! My ward round went for 5 hours today- so many new patients and all of them with devastating disease. I am afraid that my death rate is increasing by the day. Another doctor here told me that I am not alone. He has been working here for 2 years and he says that things are much worse than when he started. AIDS is completley obliterating this country. What surprises me is how quickly they die. They seem to go from being alive and relatively stable to dead within minutes. Today, a family brought a young girl in. Patients often arrive to outpatients in the back of a ute or even in wheel-barrows (yes, you read that right, they are wheeled by their relatives, often for kilometres, in wheelbarrows). This girl had pneumonia diagnosed two weeks ago. Today she became worse, went unconscious and was dead on arrival. Most of my patients die when I am not on the ward, so I have not yet paid witness to how families react to death. Basically they all collapse on the ground, wailing and hysteria breaks loose. It was complete mayhem and I have to admit, I excused myself to come to the computer. I could not pay witness to the pain any longer. Today, I made another friend. Elsie is a young Swazi woman who is a mother of 5. I have employed her to do my washing each week. I am thrilled that someone is able to do my washing. There are no washing machines here and I was very concerned about the prospect of handwashing all my clothes. Things are difficult enough as it is! Anyway Elsie arrived at my door at 6.30am. I ended up inviting her in for tea and toast. She looked like she could do with a good meal. I think this will become a ritual for us. She seemed to really enjoy the meal and our conversation- in very broken english- was pleasant. She works to give her children an education and it gives me a great sense of satisfaction that what I pay her is going to pay for a child's education. I went to inspect the clothes line at lunchtime and she has done an amazing job- far better than what I could have done. Tonight, I am having dinner with Julia and Christina. It should be a lot of fun. They are my lifeline here in Swazi. I think these nurses will be my friends for years to come. We are hoping to go away for the weekend soon and I will look forward to that event with much anticipation. Dr Pons, a South African opthalmologist here, wants to send me to a conference in Cape Town. I don't like my chances as I will still be the only doctor in internal medicine, but he says he will have a word with the boss and see what he can do. Keep your fingers crossed!! It is not all gloom and doom here at the moment and I do have moments where I can escape from everything. I woke up yesterday morning to the sounds of local Swazi music blaring into my bedroom. My little house is next to the student nurses quarters and they obviously like to spend their Saturday mornings much the same way that western girls do. I always hear lots of laughter eminating from these quarters so I suspect life as a student nurse is good. 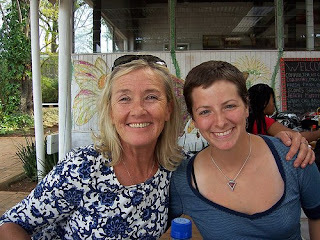 Later in the day, Julia and I went into town and onto Maduba Farm. This is a property owned by the hospital’s ophthalmologist. As a side business, they run a Bed and Breakfast and this is where I will be staying with Mum, Graeme and Rachel when they come to see me at Christmas. I needed to go and pay a deposit to ensure our accommodation. Anyway, Julia and I started walking along the road to Siteki. Let me tell you, I am not always convinced that this is a very safe excursion, but nonetheless, it is my only option at the moment. The cars zoom alongside at speeds way over the limit. My other fears include goats and dogs which amble alongside me. I know that most people consider goats harmless, but my beautiful sister Rachel, has had many an unfortunate experience with goats in her lifetime (one once bucked her into a bush of stinging nettles) and I fear that I will suffer the same fate. They look gentle enough, but I know that under that gentle exterior there is an evil spirit just waiting to buck me into danger. The other concern is dogs. Julia has warned me about them and has told me to be prepared by always carrying rocks with me to throw at them should danger approach me. The only problem is, that if I was to be approached by a threatening dog, my first reaction would probably be that of loss of bladder control. The second problem is that I am dreadfully uncoordinated. Any attempt at me aiming a rock at an approaching dog would be simply laughable. I have thought about carrying a stick with me, but the best I can find is a broom handle and I fear I will be the laughing stock of Siteki. Have I mentioned that rabies is common around here and I chose not to have that one vaccination?….. Anyway, Julia suggested a “short cut” to Maduba. Given that I trust her with my life, I agreed. It involved traversing open fields and climbing through barb wired fences. It was actually a pleasant walk until we were confronted by a herd of ~ 100 cattle, all who looked pretty pissed at us disturbing them. I suddenly was reminded of my bladder control issues in times of danger. Thankfully, my pelvic floor muscles did not embarrass me. The cattle started mooing and as they approached their horns just seemed to get larger and larger. I held Julia’s hand and she quietly told me to start acting like a black person (a bit hard when all the blood had already drained from my face). We walked slowly and casually and did not make eye contact with the beasts. Thankfully, we made it safely past them and mad it to Maduba Farm in one piece. I will not take that short cut again. However, Julia then proceeded to tell me that she doesn’t like taking the conventional way to Maduba farm as she was mugged and robbed whilst returning from a visit there several months ago. I am now faced with the dilemma- get trodden to death by a cow or mugged by an African?….. It has been a rough weekend for me. The reality of what I am facing here suddenly took hold and I have not been my happy, cheery self. Friday was a rough day. Outpatients just seemed to be a continual stream of difficult patients. I was also managing the patients in ED and my patients in the ward. I was being drawn from every angle. I had an old man present to me because he couldn’t walk because of excruciating back pain. He had to be to outpatients several times with this complaint and had been given analgesia. I started to think that we better investigate the pain further. I ordered an x-ray of his spine and found that he had a crush fracture to L1. The fracture did not look typical and I started to think that perhaps he had TB of the spine. I have never seen this before but only read about it. Trouble is, I do not know what the findings are on x-ray. I consulted the textbook that I have but it was very non-specific. I was getting incredibly frustrated as I had the potential to truly make a difference in this man’s life by making the correct diagnosis. Being a Friday afternoon, there were no other doctors around to ask for advice. As I have said previously- I am the only doctor in internal medicine. I ended up sending the patient away with analgesia. I cannot start a patient on 6 months of TB treatment if I am not sure of the diagnosis. I am going to try and get some help from my colleagues in Australia and hopefully the patient will return at some stage so I can help him further. Anyway, Patience had multiple cuts to her legs (thanks to the traditional healer) and the leg was badly infected. I did a lumbar puncture on her and the lab reported it as negative, which was of some relief to me. I commenced her on antibiotics and throughout the week, as she has deteriorated, I have tried more and more different types of antibiotics. She is not improving. Her fevers are still above 39 degrees celsius and she is now in a coma. I have examined her many times, increased all her meds and she is getting worse and worse. I have sat by her bedside and racked my brains as to what I can do for her. I know she is going to die. I wish I was smarter. I wish I knew what else to do. For the first time in my life, I feel hopeless. I am not a brilliant physician. I communicate well with my patients and because of this, I am often able to find out their symptoms etc. If I am unclear of what is going on, I ask someone smarter. I have never been inhibited by my ego. I can admit what I don’t know something. I also have a good relationship with my colleagues and this combination has always led to the best outcomes for my patients. Here, I am alone. I don’t have anyone to ask. I am limited in my knowledge as I am facing diseases I have never seen before. I feel like I am failing my patients. I have never had this feeling before. These people have nothing and I feel that I am letting them down. In an attempt to remedy this, I have spent the weekend reading. My beautiful friend, Julia, found me a copy of the National guidelines for treating TB. I have devoured every word. We have a TB clinic here and they manage most of the patients here, but they refer to me the difficult cases- quite ironic given that I am the least experienced of the lot of them. Today I will read about HIV. I saw my patients yesterday despite the fact that it was a Saturday and I am not expected to work. I just had to check on their progress. I performed a lumbar puncture on a lady who presented on Friday afternoon. I had to take the specimen to the security guard who then took it to the house where the lab technician lives. I think I am the only doctor who has called the lab technician in on the weekend, but I will deal with the repercussions on Monday. The positive about this story was that the LP identified a bug called Cryptococcus. This allowed me to give her a drug that I had not prescribed her. I had given her antibiotics against bacteria and this lab result told me that I needed to treat her with an anti-fungal. I was so happy to have a firm diagnosis and to be able to give her the correct treatment. My happiness was then overshadowed by the thought that I will probably have to tell her that she also has AIDS. Success is only momentarily sweet. I was going to go in today to check on my patients again, but I have decided against it. I need one day where I do not have to pay witness to the devastation and hopelessness of this situation. I think today has been the longest day of my life. I was up at 3am to get to the airport by 5am. I have now been awake for 27 hours and unfortunately have only made it to Johannesburg. I was delayed 7 hours in Sydney because there were "engineering problems" with the plane. In other words, there were fumes in the cabin and no one knew where they were coming from. The time in Sydney was not too bad. Travelling alone seems to make me a magnet for anyone who wants a chat. I spoke with a couple from Zimbabwe- they had been kicked off their farm and it was fascinating hearing first hand how they live under Magabe's regime. I then spoke to another man who lives in Johannesburg and again, it was fascinating to hear how he lives. I then met another couple who live in Jo'Burg but had been in Australia looking at their options to immigrate. They are astounded by the freedom the Australian lifestyle allows- something I think we all take for granted. Arriving at Jo'Burg airport was terrifying- it was pure chaos and I have to admit, it was the first time I had some tears in my eyes. I had no idea what to do as I had obviously missed my connection to Swaziland. I have learnt my first lesson about getting around in Africa- Money talks. I would hold up some cash and ask for directions and suddenly these African men were bending over backwards trying to help me. I am now in a beautiful hotel near the airport and hopefully I will get on a 10am flight to Swaziland. I'm still really buzzing about the whole experience, so I'm going to have a shower and then take my magic pills which will hopefully put me in a deep slumber. I have to admit, I fear what will be in my dreams. My good friend Darren Powrie planted a seed in my mind the other day- he told me I had a good chance of getting worms. He also gave me a textbook on parasites which I started to read whilst on the plane. I was absolutely horrified by what they could potentially do to me- crawling into my skin, spreading to my lungs, liver and then blood stream. Forget malaria and HIV, I'm now more worried about worms. It would be most unglamorous to be diagnosed with worms. Hopefully my next post will be from Swaziland. This is my very first entry and I hope that I am able to continue updating you whilst I am in Swaziland. This time tomorrow, I will be on my way to Johannesburg. I have to be at Brisbane airport by 5am so it's going to be a very early start for Mum, Graeme and myself. My parents insist on taking me to the airport and I suspect it will be quite an emotional scene for all my fellow passengers. I have to fly to Sydney first and then I fly to Jo'Burg. I have a short stay in the airport there before I catch a flight to Manzini in Swaziland. I have to stay a night there as I arrive in the evening and I'm told it's too dangerous to travel on the roads at night. I have no idea what "too dangerous" means... Anyway, someone from the Good Shepherd Hospital will be picking me up the next morning to take me to Siteki. I'm told I'll arrive just in time to have lunch at the hospital. I have no idea what I will get for lunch.... I'm certainly hoping that they don't expect me to start work right away. The director of the hospital has already told me that I'm going to be very busy! I haven't physically packed my bags yet- this is definitely something I will need help with. I have a lot of stuff. It's all in the study at the moment and I keep taking small glances at it all and praying that it all fits. I think I have done extraordinarily well in deciding what is "essential". I'm only taking 4 pairs of shoes and this is quite an achievement for someone like me. The hair straightner is definitely going despite warnings that I may sacrifice all electricity to the hospital every time I use it. "God grant me the serenity to accept the things I cannot change; courage to change the things I can and the wisdom to know the difference"
It is with this thought that I say goodbye to Brisbane and embark on my adventure in Swaziland.